Home / Blog / What are the Bulgarian traditions for New Year’s Eve celebration in the town of Bansko? Whenever you visit the town of Bansko, there is no way to get bored no matter the season. Unique celebrations are held in the region of Bansko and in the town of Razlog all year round, as well as centuries-old ethnographic traditions are honored. Every nation has preserved and has handed down from generation to generation its New Year’s Eve customs and traditions for centuries. This also applies to Bansko. The celebration of New Year’s Eve is one of the most attractive holidays in the region, as the preparation for it starts a few months in advance. If you plan to spend New Year‘s Eve in Bansko, don‘t hesitate and just do it. The celebrations in Bansko start from the first day of the New Year and continue until the end of the autumn for Dimotrovden (the name day of Dimitar). The residents of Bansko honor old and new celebrations, both secular and religious ones. The beginning of every holiday in Bansko is announced with festive bell tolling, people bring a stick of wild geranium in the hands, and according to the tradition, at the table are served sweet banitsa with rice. 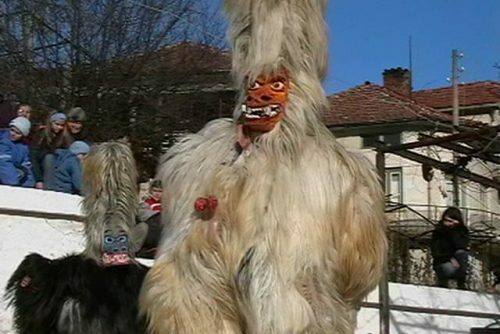 The traditional Kukeri carnival is part of the traditions for New Year’s Eve in Bansko. All the people are excited to see the variety of scary masks and they are impatient to take part in the lively Bulgarian horo. The region of Razlog is associated with the celebration of two of the most magnificent and exciting Bulgarian New Year’s Eve customs. At dawn, the small children called survakari (they tap people‘s back with a decorated cornel twig) visit the houses of people, as they bring with them decorated cornel-tree twigs. They use them to tap people on the back while singing a song for good health, good luck and fertility during the new year. To show their gratitude, the hosts gift them sweets, some money and walnuts. What is the Kukeri tradition? Traditionally, on January 1st for the New Year, and for Quadragesima Sunday, a Kukeri gathering is organized with special rituals called Kukeri games. These games are played only by men who dress in special costumes, as they put on special masks made in advance by each one of them. Young and older men dress in national Bulgarian costumes, they put on the masks, then gather together and start dancing on the streets in order to get rid of the evil forces and evil fairies. Their dances are the so-called Kukeri games. In eastern Bulgaria, the leaders of the Kukeri groups dress in traditional bridal and groom costumes. 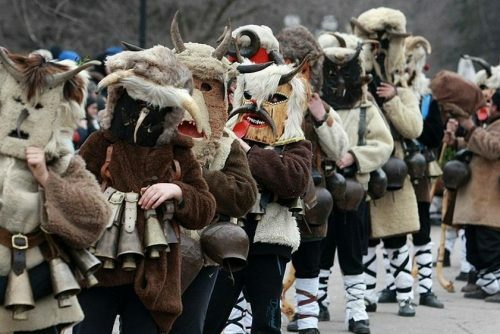 In other regions of Bulgaria, usually the Kukeri dress in costumes made of goat, sheep or deer leather with the fur from the outside, and they put on leather masks on their heads or they put some black powder on their faces. They attach to their waists bells (chans), as in one hand they hold a red wooden phallus and pometash (a wooden stick with a cloth attached to the top for sweeping away the furnace). Masks that resemble the head of a ram, goat and bull, are considered to be one of the oldest ones. According to the tradition, they must be present at every Kukeri carnival, which is real proof that the kukeri games have direct ancient connection with the ancient celebrations in honor of Dionysius. The Kukeri tradition is a symbol of the passing winter and the birth of the new life and warmth. затоплянето. It is one of the oldest customs in our lands, as it appeared 6000 years ago. It is believed that the kukeri tradition brings fertility during the next year. The kukeri are called with different names – mechkari, startsi, kukove, babugeri, pesyatsi. They are dressed in costumes that are a combination of female and male clothes and of course they have the scary masks on. In Eastern Bulgaria they are dressed mostly in bridal and groom costumes, and in the other parts of the country they dress in costumes made of goat, sheep or deer leather. They attach to their costumes bells and chans, they bring sticks to scare the evil forces and thus to welcome the upcoming spring, which is a symbol of fertility and well-being. 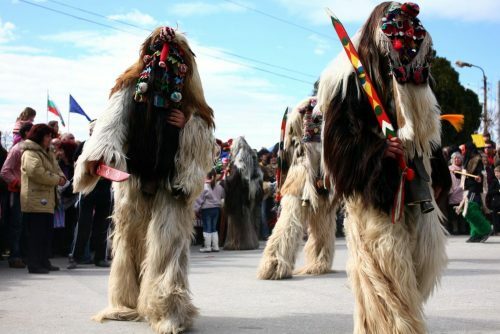 In the Bansko region, the Kukeri carnival is also called “Starchevata”, as it has pagan roots since the times of the Thracians, and it has become an integral part of the Bulgarian ethnographic traditions. The custom may be performed only by men, bachelors and mechkari with a bear. The young bachelors dress in costumes made of goat leather with big scary masks on their heads, which are usually more than 1 meter high and they have a horse tail on top. The costumes depict supernatural evil creatures from the folk lifestyle, such as goblins, bugbears, vampires and others. The kukeri put on a leather girdle and belts, on which they attach 4 copper bells. They perform the Kukeri games (special rituals) in order to scare away the evil forces and to bring health and fertility for the entire village. 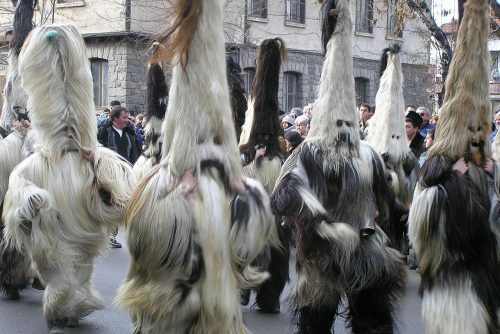 During the Kukeri games are carried out elements of the folk traditions as well as fertility spells. From early dawn on January 1st, a lively carnival festival starts and moves to the center of the town. In the center a competition is held, where the head armed guard is elected. The celebrations continue until the evening. When they are over, the orchestras of the separate neighborhoods visit the home of the head armed guard, which marks the end of the festival. A competition for the most beautiful kukeri costume is also organized at New Year’s Eve. The main participants in the Kukeri games are the Young man (Grandpa), Bride (Grandma), Tsar and the rest of the kukeri. The tsar should be an adult man who already has a family, children and property. He rides on a cart, and after it the kukeri drag a wooden plough with which they „plough“ the land. In the cart there is a bushel of grain, which the Tsar symbolically sows. The kukeri gather in the center of the village, and from there they start the walk to all houses to make the spell for fertility and health. The owners give the „guests” wine and food, and the kukeri kiss the hand of the owner. After they finish the walk in the village, the kukeri group returns to the center where it performs an ancient ritual. First, the kukeri run in different directions striving to make noise as much as possible with their bells. It is believed that the more noisy they are, the better they can chase away the evil forces and spirits. There is also a Bride that awaits them, as she is about to start arranging the household, but she only makes a bigger mess. The young man performs a ritual of „fecundation” of the bride in the bustle, in order to give birth to a new beginning, and the kukeri give three slices of bread to the Tsar. Then two of the kukeri harness to the wooden plough and a „ploughman” drives them ritually. After them, the tsar is sowing grain from the bushel, and the entire group follows them, jumping and swinging swords. The tsar gives his blessing for fertility, then one of the kukeri kills him ritually, and the others gather around him and perform a “resurrection”. Then the Bride „gives birth” to a child, which marks the new beginning. This means that the farming year can start and the celebration continues with a horo. At the end of the festival, all people gather for a great feast with the donated food by the people. The town of Razlog, for example, is one of the towns where each neighborhood has its own kukeri, bachelors, brides, orchestra and mechkari with a bear, as their identity is kept in secret. In the town is organized an International Kukeri carnival “Starchevata”. It is usually held on January 15 at the central square of Razlog. Members of the Federation of European Carnival towns and cities come for this event. Razlog became a member of the Federation of European Carnival towns and cities 16 years ago. demonstration of traditional motifs in the kukeri clothes an masks, specific for the given region, level of artistic performance. 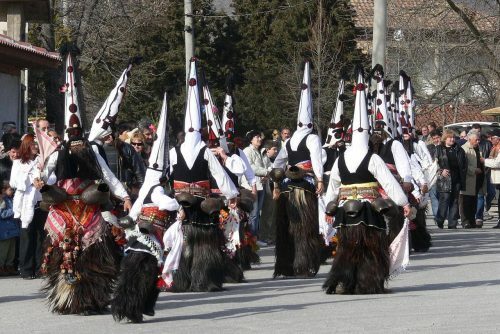 Typically, the kukeri in the Bulgarian groups are 50 people, and in the foreign groups the participants are 30. 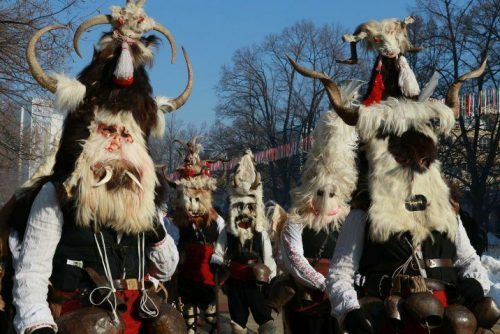 The international kukeri carnival, of course, is a continuation of the New Year‘s Eve Kukeri carnival „Starchevata” in Razlog. The local residents calls the kukeri “chaushi” or “startsi”. The main participants are the bachelors, young men and young girls. They dress in original traditional costumes that are passed from generation to generation, as the technology of production is very old. In Razlog, for example, each house has kukeri costumes, which are left by previous generations, and people value these costumes very much. Usually, kukeri walk together in groups and one of their tasks is to protect the horo of bachelors and young girls. Typical for New Year’s Eve in the town of Bansko is the appearance of the traditional babugeri. 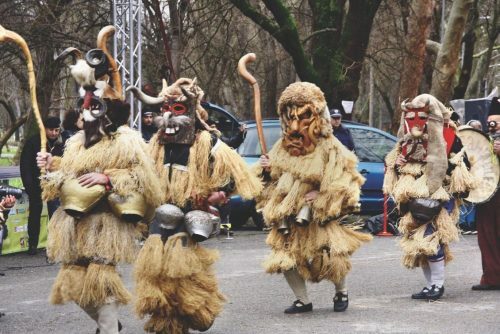 Male residents from Bansko dress in costumes of babugeri and dance in the streets in order to chase away the evil spirits, for the celebrations. Their costumes are made of goat leather with the fir from the outside. They also wear leather masks on their faces that are also called “surati”, and to their waist they attach a few heavy bells or chanove. This custom is associated with the celebration of Yordanovden. On January 6th, around 10 a.m., a solemn liturgy in the local church marks the beginning of this tradition. Then the residents, singing traditional songs, go to previously chosen place in the river. The priest sanctifies the water, then he throws the cross of Christ in it and the group of young unmarried men jump into the ice-cold water to get the cross. Once the cross has been found, the group of men visits the local houses and sprays the hosts with the holy water for good health and fertility, and they receive gifts for that. Lively horo and dancing at the square continue until the evening.